I don't know what these creatures are. They fly and have eaten the lilac blooms and now are eating the leaves, my ferns, marigolds and my hydrangeas. I have tried, garlic spray, soapy water and Bug B Gone, nothing seems to get rid of them. I can't find their pictures in any book or website. I have never encountered them before! I need some help before the eat my whole garden. Dawna, what you have is a chafer beetle, related to the June beetle and the Japanese beetle. They are a horrible pest as they will eat just about any flower or fruit they can find, as well as strawberries, grapes etc. The organic treatments you have chosen won't work, as this is a hard bodied insect, and so needs different treatment. First of all, if you have the patience you can go out into your garden with a torch at night and take them off one by one. Put them into a bucket of soapy water to kill them. You can also patrol your garden during the day, as you will find them in full daylight too, but they seem to be more active at night. Secondly, it helps to cultivate the soil around your plants. This disrupts the breeding cycle, and you will get less of them. You can also try and set up traps for the chafer beetles. You will trap a lot, and you may not think that it is working to keep the population down, but over a 4 year period your chafer beetle population will have been seriously depleted and far more manageable. There are some people who have had a lot of success using nematodes which you can buy from your local nurseryman. Just remember to keep them cool before you use them, as they are living organism. I haven't used them, so I cannot comment. I use neem to keep my chafer population down. It is one of the best I know. I also keep chickens, ducks and turkeys and they all free-range over my garden. 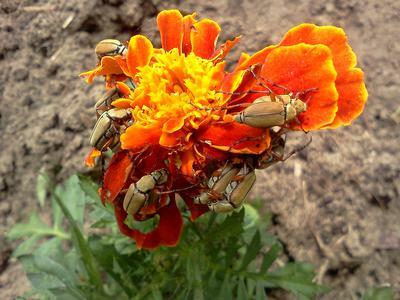 Yes, they do some minor damage to my plants, however, they do eat a lot of beetles and the grubs, and so I am happy for them to be there. Guinea fowl are dynamite with the chafer beetle if you have any! Wishing you all the best with your fight against those dreaded beetles!